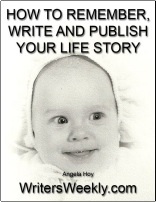 Writing about your life sounds fun, easy, even entertaining sometimes. A personal essay, most of the times, feels like an easy idea to pitch to your editors –after all, you have already lived the story you are pitching, right?– and a quick way to make some extra money. In addition, when you tell your friends that you are writing about your past relationship, for example, they always say something like “I wish I could get paid to write my memoirs”. Little do they know. Sure, writing about your life sounds fun and, the truth is, that most of the times it really is. But what about that tiny little line that separates your personal life from your work life? In other words, how much information is too much information? Seriously, if you want to avoid drama, just do it. If, for example, your friend’s name who’s involved in the story is Mary, rename her to Diana or any other name she would like. If she is tall, make her appear short. If she has been in a relationship for more than two years, make her single. Do whatever it takes to make your friend read like a totally different person. When we, writers, write about a personal experience, we tend to put our objectivity aside. Nobody can blame us. We are people too. In order to avoid producing a one-sided story with a limited point of view, make sure you remain calm and don’t attach yourself to the situation, no matter how disturbing or emotional it might have been. We write about facts, not a personal diary after all. Try this technique: If you are writing about your worst break-up ever, for example, just think: Whose side would another person would be on? Then, try to write the same way that person would. It’s the Internet. You know it right? Everything you write will, most likely, stay on there forever. Can you live with a personal story, either yours or a person’s close to you, published in eternity? I know that most of the personal stories you pitch to your editors are important for the time being, but are they worth the people’s who Google your name attention? This is an important question to sleep on the night before you hit that end” button on the query e-mail you’ve been writing. Alain de Botton once said: “I was uncomfortable writing fiction. My love was the personal essay, rather than the novel” explaining that fiction is not for everybody. Same goes for personal essays. You are a writer and that’s great! However, being one does not always mean that you are a born essayist too, so make sure you really figure out whether you like writing about real-life stories or not. After all, no matter how many techniques you are going to develop, your circle will always grumble. Sometimes, even you, when you go back and re-read it.